When people see our new, beautiful Cat Lodge, they’re pretty impressed! 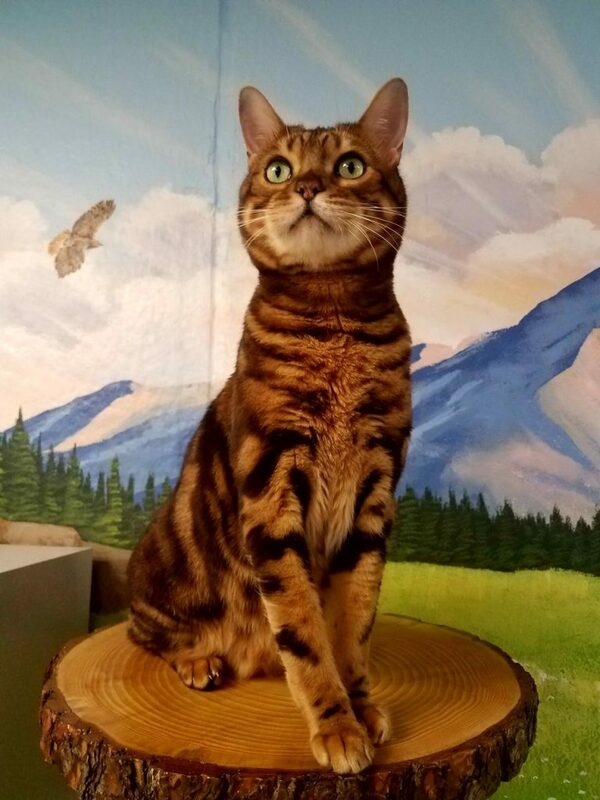 With its sleek condo spaces, stunning wall murals reflecting Colorado mountainscapes, custom built cat trees made from real aspen and spruce, and a colorful and entertaining fish tank, we couldn’t be happier to show it off! Created with the comfort of our feline guests in mind, our Cat Lodge is a special place for cats of all ages and sizes to hang out when their families are away. Whether your special friend loves to lounge, nest, explore, or be entertained, you can rest assured that your special companion will find something that suits his or her fancy. Our beautiful and modern Cat Lodge allows cats to be housed in their own private quarters, separate from other pets, providing much needed peace and tranquility. The atmosphere is relaxing and stress-free, and filled with cat-friendly activities and objects of interest. At Lone Tree Veterinary Medical Center, we also know that each of our feline guests is unique, and that’s why our experienced Pet Care Specialists take the time to know each one by name and focus on their individual needs. All full-time staff members, our Pet Care Specialists truly enjoy caring for our feline guests and go the extra mile to make sure that they have a comfortable experience while staying here with us. In addition to providing our feline guests with the absolute best care, we are proud that our Pet Care Specialists are also cat lovers! Each individual in our Boarding Lodge has a deep understanding of the special needs of felines, and is experienced in their safe and ethical handling and treatment. Not only do we employ loving and experienced staff, they are also long time cat owners, and several have lived with cats for most of their lives. We understand how stressful it can be to leave a beloved pet behind when you have to be away. Rest assured that our loving staff will take the time necessary to get to know your individual cat, and provide the one-on-one love and attention he or she is used to receiving from you. You can also enjoy your time away, knowing that we have a state-of-the-art medical facility right here on site, staffed daily with a medical team well-versed and experienced in the care of cats. If you’d like to schedule a medical service for your cat while boarding or if your cat needs medical attention, our team is here to help. Please don’t hesitate to contact the staff at Lone Tree Veterinary Medical Center with your questions about our new Cat Lodge and our cat boarding services. We invite you to tour our Cat Lodge and get to know our wonderful staff!